We’d love your help. Let us know what’s wrong with this preview of A Whack on the Side of the Head by Roger Von Oech. This is the 25th anniversary edition of the creativity classic by Dr. Roger von Oech. Over the years, A WHACK ON THE SIDE OF THE HEAD has been praised by business people, educators, scientists, homemakers, artists, youth leaders, and many more. The book has been stimulating creativity in millions of readers, translated into eleven languages, and used in seminars around th This is the 25th anniversary edition of the creativity classic by Dr. Roger von Oech. Over the years, A WHACK ON THE SIDE OF THE HEAD has been praised by business people, educators, scientists, homemakers, artists, youth leaders, and many more. The book has been stimulating creativity in millions of readers, translated into eleven languages, and used in seminars around the world. To ask other readers questions about A Whack on the Side of the Head, please sign up. Did rhis author write other books? This is a book to always come back to. When I am in a slump and not feeling "it" I turn to Roger Von Oech. A mentor 16 years ago highly recommended this book. It is one of the well worn books on my shelf! I read this book in a couple of hours. It's an older book that has been on my shelves for an age. Maybe two ages. It's the 1983 version and lacks the slick, over-designed look of today's books. It has comments by people relevant at the time. In fact, it was from a time when our industries were still relevant. Before we started truly believing that Americans are no longer innovative industrialists. This book made it clear to me what thinking has made it so. This book also made it clear how I've part I read this book in a couple of hours. This book also made it clear how I've participated in the way of thinking that prohibits true innovation. It's a marvel. Really. Everyone needs to pick up a copy of this book and read it. There's nothing startlingly new in it. Even the way it's illustrated is a little old school and kitschy. It says everything you need to know succinctly without dragging on and on. It keeps it simple. You will want to start every meeting with puzzles after reading this book. It will make you consider your black and white thinking, even if you think you don't have any. You will go for a walk/run/swim/bike ride with your eyes wide open, excitement filling your brain like you've suddenly woken up after a really long nap. You will feel ready to DO not just to study. You will close your laptop and go make something. I read this because Mark Rosewater (of Magic the Gathering fame) recommended it in a number of his podcasts. 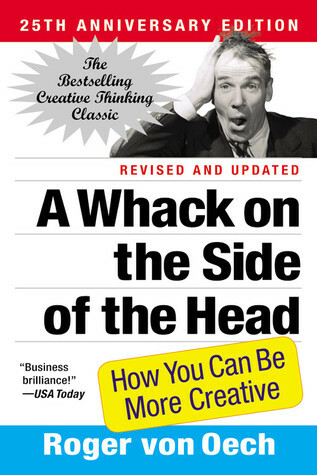 It's sort of a self-help book for people who want to be more creative. Or a study in the whys and wherefores of creativity. And if you're truly in a position where constantly reinventing your approach to become essentially institutionally (or even industrially) creative, this book has a lot of great approaches. For the rest of us... It's nice to look back on when we're stumped about stuff, I read this because Mark Rosewater (of Magic the Gathering fame) recommended it in a number of his podcasts. For the rest of us... It's nice to look back on when we're stumped about stuff, I suppose... But I'm not certain I take anything away from it directly. Maybe the next time I'm stumped on something it'll help, but in all honesty, it's been quite a while since I've been that kind of stumped. Perhaps rather than "more creative", what I truly desire in my own projects is "more artistry", which this book doesn't really address. Anyway: it's got some nifty thoughts. It'll sit in the back of my mind for a while, and I probably won't trade the book away, so that I can come back to it in the future. It spoke truth, not shyster-ism, to me. This is a wonderful book for anyone - teachers, office workers, students, salesmen - anyone can get something helpful out of spending a little time with this book. It gives you methods for looking at problems from outside the box - WAY outside the box in some cases! But it can help you break out of the, "we've always done it this way..." solutions to problems! Loved that one. I bought a few extra copies and gave to a few of my most creative friends. This book gives a few tricks to unlock creative potential, as well as guidelines on how and when to use your creativity. Recommended for everyone. If God is the Creator and we're made in His image, then to be creative is to be more like God. This book is a fun and practical guide to awakening and encouraging your creative side. Lots of tips and strategies for jump-starting your students' creativity. This is a classic. I don't know what else to say, but definitely read this if you intend to have a creative career. This review has been hidden because it contains spoilers. To view it, click here. An excellent book filled with practical exercises on how to unleash creative thinking. It's a book that merits more than one thoughtful reading. Lots of good ideas on how to be creative and improve your creative thinking. I re-read it every few years. It makes me feel centered and is a wellspring of great ideas. Very approachable in that you can basically open to any chapter and jump right in. Also check out the "Creative Whack Pack" cards, great for brainstorming. I read a fair amount of posts on LinkedIn, Medium and other sources on productivity and creative thinking (which is probably why I don't get around to being productive). So, when I see that this book, written 35 years ago, espouses the same themes of listening to your unconscious, bending the rules, being willing to be foolish, and so many other axioms of accessing your creative self, I understand that these contemporary scribes have been drawing on the original gangster of innovative thinking, I read a fair amount of posts on LinkedIn, Medium and other sources on productivity and creative thinking (which is probably why I don't get around to being productive). So, when I see that this book, written 35 years ago, espouses the same themes of listening to your unconscious, bending the rules, being willing to be foolish, and so many other axioms of accessing your creative self, I understand that these contemporary scribes have been drawing on the original gangster of innovative thinking, A Whack on the Side of the Head. It's a quick read, and probably a useful refresher. I didn't enjoy it much, mostly because I'm currently experiencing a creative block and reading this book just made me uncomfortable. I think that's good and healthy, hence the three stars, but it just felt like forcing myself to eat my vegetables at the moment. Definitely dogeared a few pages as reminders to myself though, and hopefully I can get out of my rut soon. A nice entertaining book. You get to learn a lot of interesting facts from history that the author has collated to explain the different scenarios in the book. Overall, a good book and a quick read too! It took me awhile and many different attempts to get through. There is definitely some good and relevant info in it- for problem solving and becoming more creative. It’s just not my flavor of book. But I can see how others would find it very beneficial. An insightful and humorous approach on creativity, even if somewhat repetitive when read in a short amount of time. Not sure about the older editions, but the 25th anniversary one has beautiful illustrations through the whole book. 평이 좋아서 읽었는데 별로였다. 헤라클레이토스 명언집을 구해서 읽어봐야겠다는 정도. Fun, fast and innovative. I love the drawings and the ideas are pretty good too. I highly recommend it. It contains actionable advises nearly on each page. Read it and go create. Fun and easy book about breaking through routine patterns of thinking and finding our creativity. Very insightful, if a bit silly. Rather disappointing. I am not sure why people still recommend this book. Most of the information is commonplace now. Dated.